The Artist and the dog and I do not bang and zoom around the countryside on fat-tired machinery, but we enjoy less-traveled roads and opportunities to get out of the car and explore. Friday began with another visit from the flock of mountain bluebirds featured in my last post, an event exciting enough that I would have been content to shop for groceries in Willcox and come home and clean the house. But when the Artist says, “How about…?” and his idea promises a good time, I rarely say no. After all, housework won’t disappear if it doesn’t get done on any particular afternoon. We had noticed a certain tempting “primitive road” before but had not, as the Artist says, “stuck our noses down it” on other days. Now, however, the sun was shining, and we were ready to say yes to the road’s invitation. Oh, the rocks! Like the fabulous rocks in Texas Canyon, but far from expressway traffic. Oh, the views! Close up and off into the distance, every aspect was enchanting. We felt we were in the kind of environment and having the kind of experience that people travel halfway around the world to find, and no one had “managed” it for us with guideposts and rest areas. Recent rain had brought out the season’s first bajada lupines (not pictured here), the largest ones along this road no more than two inches across (and no flowers yet, of course), but I was equally pleased by a beautiful clump of grass and its shadow. Even an old rusty can had a story to tell, of cowboys eating beans while taking a break from moving cattle. Because we did encounter cattle. 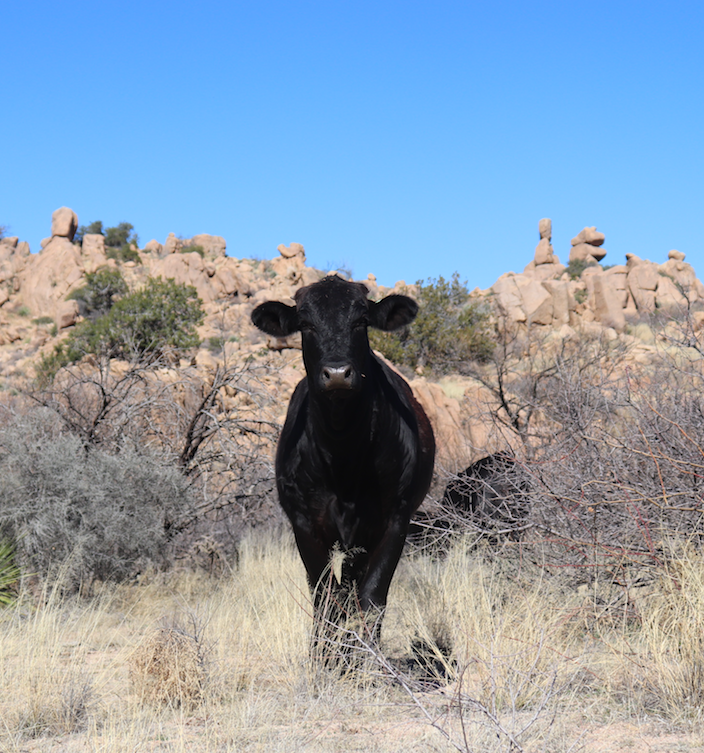 No bighorn sheep or mountain lions, but gorgeous black steers with coats so rich and glossy in the sunlight and mountain air that they pleased us as much as wildlife would have done. We drove a prudent distance from the cattle before letting Sarah out to stretch her legs and apply her busy nose to the ground. What a good dog she is! On another day, when we go back again, I would love to take along a picnic lunch. We had water, of course, but not so much as a granola bar or a peanut to snack on, and the fact that we lingered in the wilds so long, despite hunger, is an indication of how enthralled we were by the terrain. I’ll want my large sketchbook and pencils with me next time, too. But these “lacks” were hardly flaws in our Friday adventure. No, despite the lack of planning, our day was completely satisfying. It even provided a couple of especially unexpected and delightful additions to an expedition that would already have been perfect without them. 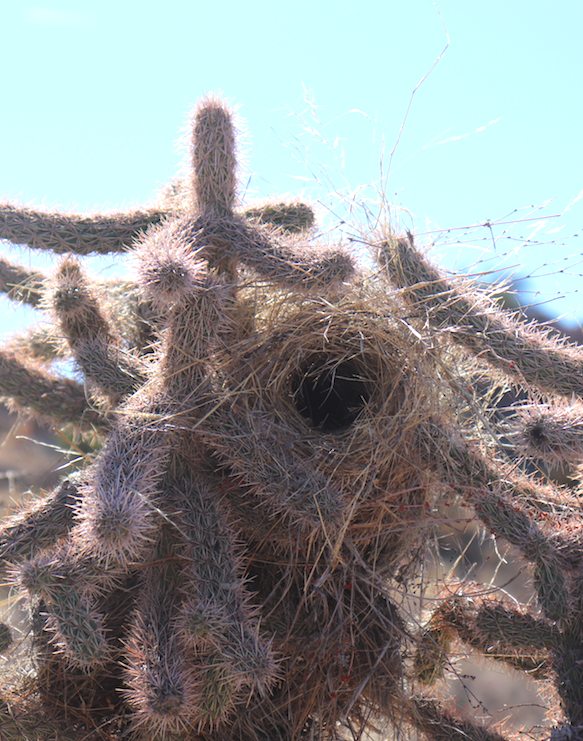 Large, straw-colored, oven-shaped [“front-loading,” that is, rather than “top-loading”] nests are woven from fine materials and usually placed in a thorny cactus or spiny tree. Males may build up to five extra “dummy” nests, which can be used as roosts, as well as to discourage would-be predators. Chugging song, a lengthy series of krr krr krr notes, suggests someone cranking the motor on a older car, trying to get it started. Loud and often heard, for many the song of the Cactus Wren evokes the Arizona desert. All in all, our spirits were high and hearts full as we resumed the paved road. And yet we had not yet reached the end of the day’s surprises, for there along the roadside, weeks before I would have begun to look for them, Mexican poppies were blooming! My Audubon Society Guide to North American Wildflowers, Western Region, gives the Spanish name, along with the Latin for this bright, cheerful roadside flower, and so we learn that the very formal-sounding Eschscholtzia mexicana is more familiarly known as Amapola del Campo, or the “poppy of the countryside.” (I like that sweet, peasant-sounding name.) Audubon, or in this case Richard Spellenberg of New Mexico State University, identifies the plant’s habitat as “open gravelly desert slopes” and notes that “When there have been ample winter rains, this Poppy sometimes grows in dense patches.” Dense, bright, and beautiful, I would say, though the patches are more extensive along 191 going straight north to Safford. Well, it was a very full day, and Sarah had a pretty good time, too, which always adds to our happiness. Oh my! How wonderful this all is, from the bluebirds to the landscape to the cactus bird nests, to Sarah running with a smile on her face. Such a great day! I hope you go back and give us more! It is great to wander the hinterlands and commune with nature. I worry a bit that along with wrens, bluebirds and range cattle, Arizona is home to some serious large cats ! I still love the places we visit over and over, but I was happy to discover new territory and have it to share with you all -- and I'm sure we'll go back, Dawn. You know how we are about visiting our favorite places repeatedly! And yes, there are mounain lions in the mountains, BB, but I don't expect to see any. Actually, won't mind not seeing any! Oh! What an adventure you have given us with all these marvelous photos! Some rocks look like they are ready to topple over, and others remind me of big animals. It’s like seeing images in clouds, but these are rock formations - and I love them! The grass picture is perfect, and with the bean can, we’re taken back a few centuries. I am a big fan of cows, of all kinds, and here in Brazil there are many white Brahmin ones with humps behind their heads which make me think of India. But your black ones are just lovely! Then we get yellow Mexican poppies to boot, just popping out of the picture. 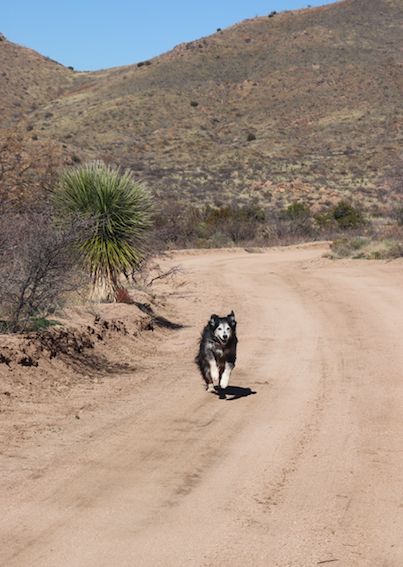 Sarah’s happy face and prancing energy are perfect to end your wonderful off-the-road visit.